Experience the true spirit of Mexico and the rhythm of the ocean at the Grand Velas Riviera Nayarit. 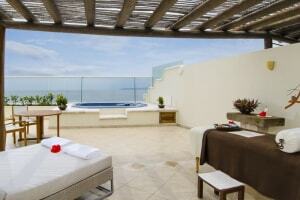 Its dotted along the white sandy beach of Banderas Bay where the hotel promises to go beyond your desires. 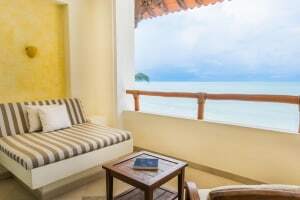 It features exclusive rooms laced with the magnificent ocean view, an infinity pool, a decadent spa, kids ‘club, and five delectable restaurants. The architecture is graced with contemporary Mexican designs with its bold lobby and fountain while you wake up to the sound of waves and stunning views of the Sierra Madre Mountains throughout your vacation. 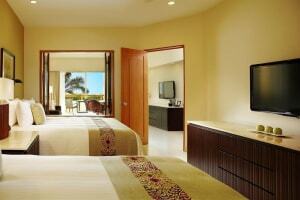 Also, the resort has bagged the Mexican Pacific Award Five Diamonds by AAA. Program of your choice: Baby Concierge, Digital Detox, Digital Concierge or Wellness. Oozing elegance in every direction, the Sen Lin restaurant is perfection. It brings Asian delights to the table tossed and fried with exotic flavors and fresh ingredients. Each dish is colorful bursting with strong flavors that are cooked with traditional recipes combined with modern creations. Reflecting the origin of Mexican culinary delights, at Farida, the dishes represents a deep connection to the heritage. The vibrant food is represented in colors from yellow to purple that mirrors the Mexican spirits. These creative dishes are well cooked with bold spices and aromas, while these authentic dishes get a modern twist. It divided into two sections indoor and outdoor seating; itme is also live with music performances to enchant your dining experience. Taste the true essence of Italian food at Puerto Vallarta as you dine in Lucca. The restaurant is lit with elegant setting while serving bold Mediterranean cuisines from Pacific seafood to pasta. With warm ambiance and laced with beautiful ocean view amp your dining experience with live piano music. Bring the French cuisine to your plate; the Piaf combines innovative techniques with the traditional ones. Dig into the different range of food from fish, seafood, and meats well cooked with authentic French style using fresh local ingredients. Adding to this, the décor makes your dining experience special with its sophisticated setting. A beautiful poolside café, Selva Del Mar serves comfort food and light bites. The menu is packed with Mexican inspired food with a global twist like appetizers, ceviche’s, seafood, cocktails, sandwiches, hamburgers, salads, grilled kebabs, and tacos. Designed in open-air style it offers a relaxed coastal vibe with captivating views of the Banderas Bay. If you have dietary requirements kindly let the staff know. Designed in a beautiful al fresco setting, Azul will tantalize your taste buds with enchanting cuisines including Chinese, Japanese, Mexican and Italian. Sitting by the pool this restaurant redefines waterfront dining experience by offering panoramic views of the endless ocean. The restaurant will allow you to savor some mouthwatering fresh seafood, sushi, sandwiches, salads, and prime cut grills. Welcoming the little ones, the kids club offers daily activities from nature adventure, cultural programs to arts and crafts. They also offer excursions like snorkeling, scuba, whale watching, and dolphin adventure. The club also caters to teenagers from age 13- 18 and offering Xbox Kinect, billiards and air hockey while those want to have fun can head towards the mini-disco and enjoy karaoke. The teen club opens from 3:30 PM to 11:00 PM. Strick the right balance between your mind, body, and soul as you head towards the SE Spa. The is built only one philosophy – wellbeing, where the rituals and treatments achieve nirvana while connecting your senses through natural elements. There are around 30 holistic treatments, massages, and hydrotherapies with use of only natural products from different plant extracts, oils, and aromas. The infinity pool has three levels that overlook the ocean, one level is meant of adults, other for teens and last one for the kids. There is no capacity for an extra bed in the room and children of all ages are welcome. Pets are not allowed.